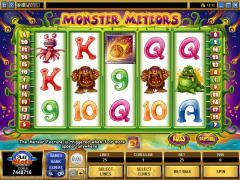 Monster Meteors is a 5 reel 25 payline video slot from Microgaming. It is based on the popular outer space theme with monstrous aliens. The reels are set in outer space with the earth below and a meteor filled sky in the background. There are four monsters on the reels. One is a big fat green monster, another is a one eyed monster, the third has no limbs and eyes on its antennae and the last one is ogre-like without a torso. There are the usual high value cards from nine to ace. These appear like bright slimy inside parts of the monsters bodies. The wild symbol is the soldier with a laser gun and the scatter symbol is the meteor. Only the wild symbol and the scatter symbol show animation. The soldier gives a look of sadistic pleasure and fires his gun. In the meteor animation, there is a thundering sound, a flash of light and the meteor starts rotating. The coin denomination range in Monster Meteors is heavily skewed to the lower end. The available denominations are 0.01, 0.02, 0.05 and 0.10. This makes Monster Meteors predominantly a low rollers game. The denomination is be chosen by operating the buttons below the denomination indicator. 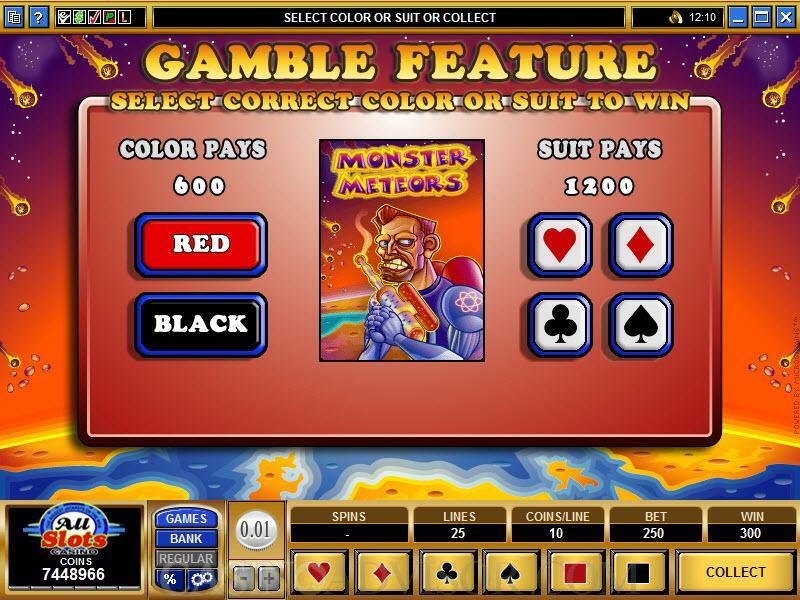 The slot game has 25 paylines and these are enabled in increments of 1 by operating the plus and minus buttons below the paylines indicator. By operating the LINES button the number of enabled paylines increases in multiples of 5. 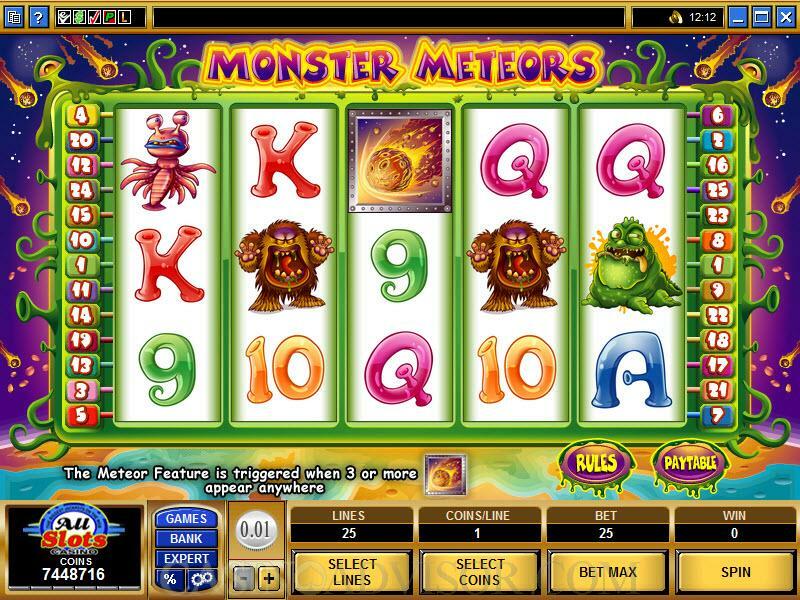 Monster Meteor allows up to 10 coins per line. These can be increased in increments of 1 or of 5 as in the case of paylines. After setting the above parameters the reels can be spun by clicking the SPIN button. By clicking on the BET MAX button the player automatically chooses 25 paylines and 10 coins and sets the reels in motion. The wild symbol offers the largest fixed jackpot of 5000 coins. It does not multiply payouts. Two or more scatter symbols anywhere on the reels offer scatter payouts. Three or more scatter symbols trigger the Meteor Feature. This feature ensures a minimum of 5 free spins at tripled payouts. However before the free spins are taken a bonus game on the second screen is played. The player chooses three monsters, which are then gunned down by the soldier. 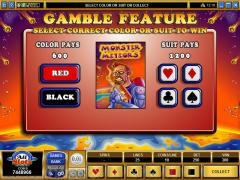 Each monster reveals either additional free spins or multipliers or bonus credits. The bonus credits are directly added to the player’s balance. The free spins and multipliers are added to those offered in the base game and the free spins round is then taken with the enhanced values. In the Gamble Feature players can, if they want to, stake their winnings. If they guess the color of the face down card they can double their winnings. If they guess the suit of the card they can quadruple their winnings. However, if they guess wrong they can lose their winnings. Interested in reading more detailed information about Monster Meteors? If so Click Here for more details.